Department of Rehabilitation Services is an EMPLOYMENT agency for people with disabilities. Their goal is to assist indviduals with disabilities in their search for employment that matches their interests and abilities. 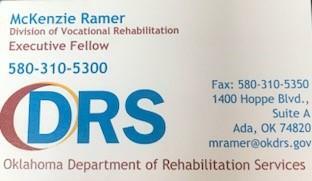 Please visit www.okdrs.gov for more information on Vocational Rehabilitation Services.